I’m about to publish my second fantasy novel! This is an exciting day and one I hope you’ll help me celebrate by sharing this post with everyone you know on your blog, twitter and facebook. The release date is 16th June 2017. The pre-order price is 99p but will go up to £2.99 the week after publication. Here’s the universal book link on Amazon. You can add The Lost Sentinel to your Goodreads want to read list now, plus news of a paperback giveaway will follow soon. The Lost Sentinel is an enthralling fantasy set in a world divided into those who have magic and those who do not. It is a world on the point of self-destruction. The trials and tribulations of the main character, Tei, as she follows her destiny will have you on the edge of your seat. This is a book full of magic, suspense and bloodthirsty action. It will leave you in parts elated, devastated and finally desperate for the sequel which you will be pleased to hear, the author has already partly written. Rogerson’s characters are so well-realised and the plot so intricate that you will find it hard to put this book down. Don’t forget to order your copy of The Lost Sentinel now for only 99p. ARC will be available by the weekend if you’re a book reviewer / blogger and are willing to review during publication week – 16th June. Even if you can’t meet that date or would prefer just to post about the book release, please get in touch. I’m also happy to do guest posts etc. My big news is that Visions of Zarua is about to get some publicity via The Book Fairies. On Tuesday 2nd May 2017 they will be hiding 20 copies in public places and posting about it on twitter and instagram. It follows on from the initiative of Books on the Underground, which I’m sure many of you will be aware of Emma Watson (Harry Potter star) supporting. The Book Fairies are all over the world, currently 25 countries are involved. Check out their website ibelieveinbookfairies for more information. I believe this book drop will be nationwide, so who knows who will pick up a copy! Hopefully, lots of book lovers will find Visions of Zarua, take a picture and tweet about it. Then they can take it home to read, before returning it to any public place for another book lover to find. If you find it, let me know what you think. I love hearing from my readers. Amazon book link – If you’re not lucky enough to find a copy, it’s free to read through Kindle Unlimited. My other big news is that I’m almost ready to set up the Amazon pre-order for The Lost Sentinel! I still have a couple of minor details to work through, but it is almost there and I’m so excited. I hope to reveal the book cover to the world next week. I’ll also be looking to send ARC’s to book reviewers, but I’ll post more about that once the changes are done. Here’s a taste of what The Lost Sentinel is about. Cover reveal, excerpt and a beta reader’s review will follow in the coming weeks. If you’d like to review either The Lost Sentinel or Visions of Zarua please get in touch. I’ve been very busy this week editing my next book, The Lost Sentinel, which I’m hoping to publish in the next few months. There are still a couple of days left to enter the Rafflecopter giveaway for Visions of Zarua, my debut epic fantasy. It’s an international giveaway and all you have to do follow me on twitter etc. It’s all set up via BrizzleLass who reviewed the book in December. Don’t forget, Visions of Zarua is still free to read on kindle unlimited UK and US. I’m still editing The Lost Sentinel, but I wanted to share the blurb to see what people think. It’s a work in progress, so any comments will be gratefully received. The magical island of Kalaya is dying, along with it’s Sentinel. With the Kalayan people turning their back on magic, can Tei help the exiles find their new Sentinel before it’s too late? Tei’s always hidden her magic to avoid persecution from the Assembly who govern Kalaya. She lives happily as a tailor’s daughter until an old friend of her father’s visits bringing news they’re in danger. They flees for the Turrak Mountains where other exiles of magic have made their home. On the journey, an enemy attack leaves her father wounded. He sees her into the care of two exiles, Rike and Garrick, and on his deathbed makes a shocking confession that changes Tei’s life. Struggling with self-doubt, Tei joins the exiles in the search for their lost Sentinel. But the masked riders want the Sentinel too, and time as well as hope is running out. Can the exiles save the island magic and reunite the Kalayan people before ignorance destroys them all? Are you intrigued? Let me know. 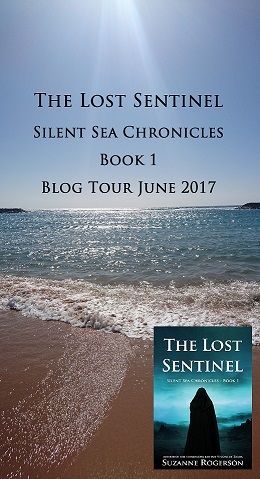 Additional question – 8/1/17 I changed the series title from Bloodlines Trilogy to Silent Sea Chronicles. Blood seems to feature so often in books that I wanted to go for something more original. Any thoughts on Silent Sea Chronicles? I’m taking a bit of a break from social media for now, just so I can get The Lost Sentinel ready for publication. I’ll still post the odd book review and photo, and respond to all comments, so keep in touch. And a belated Happy New Year to everyone!